Police ignored threats by Arabs to butcher Jews ascending the Temple Mount but arrested an Arab for trying to stab a police officer. Police ignored threats by Arabs to butcher Jews ascending the Temple Mount but arrested an Arab for trying to stab a police officer. The police also arrested Likud nationalist Moshe Feiglin for attempting to pray there. 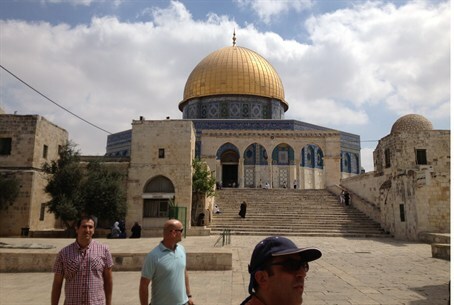 A number of Jews, including those from the Our Land of Israel movement, went up to the holy site on Tuesday despite rumors Monday night that Arabs planned to cause problems. The police were alerted but provided no protection for the group of Jews. “When we went up on the Temple Mount, we were greeted with cries of ‘Allah is Great,’” said Asaf Fried, one of the members in the group. “The police still did nothing,” and the group of Jews escaped without harm. Earlier, the police arrested Feiglin, head of the Jewish Leadership faction of the Likud party, alleging that he was trying to pray at the Temple Mount, which is considered a crime by the police. “The decision of the police [to arrest me] is a surrender to the Muslim Waqf and without any real reason, Feiglin said. Police spokeswoman Luba Samri told AFP, "Two Jews from a radical rightwing movement were arrested this morning while trying to disturb the peace on the plaza. One of the two, Moshe Feiglin, had started to pray, and the second had lain down on the ground.